Audi intends on releasing a facelift version of their successful compact crossover this year, boasting a handful of aesthetic improvements. 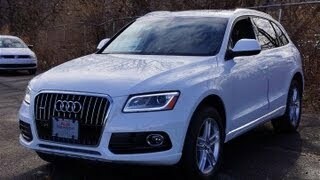 However, the most notable changes brought to the Audi Q5 2013 are to be found under its hood. Interestingly enough, the Q5 2013 will also be made available as a hybrid, alongside three diesel engines and two petrol units, for a total of six engine variants. First and foremost, let's take a look at the base model which sports a 2.0 TDI four-cylinder engine developing 143 horsepower and 236 lb-ft of torque. The 2.0 TDI found in the base variant is coupled with a six-speed automatic transmission and comes only with front-wheel drive. As far as fuel efficiency goes, the 2.0 base model can cover 44 miles to the gallon, making it the most fuel efficient Q5 variant. Next in line is a 2.0 liter TDI engine developing 177 horsepower and 280 lb-ft of torque. The second diesel engine is mated with an Audi S-tronic seven-speed dual-clutch gearbox and will only be available as a four-wheel drive, bringing the fuel efficiency down to 38 mpg. The third and last diesel engine comes as a beefy 3.0 liter V6 which develops 245 horsepower and 428 lb-ft of torque. Allegedly the V6 variant is able to combine both power and fuel efficiency, and can go from 0 to 60 in 6.5 seconds while being able to cover 37 miles to the gallon. 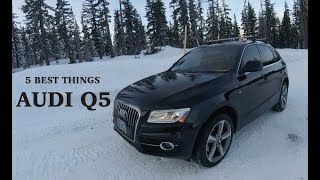 Now that we've got the diesel engines out of the way, let's take a look at the two petrol engines offered in this year's Audi Q5. The standard gas engine variant sports a 2.0 liter turbocharged four-cylinder unit able to develop 225 horsepower and 258 lb-ft of torque. The 2.0 liter unit has been coupled with a six-speed manual gearbox as standard, but an eight-speed automatic transmission is available as optional. 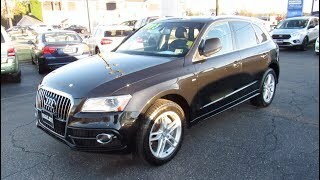 The second gas engine comes in the form of a supercharged 3.0 TFSI unit which replaced the older 3.2 liter engine. The new 3.0 engine is able to develop 272 horsepower and 295 lb-ft of torque. The beefier gas engine is coupled with an eight-speed tiptronic transmission, can go from 0 to 62 in 5.9 seconds and delivers a fuel efficiency of 27 mpg. Last but certainly not least, the brand new hybrid model which combines Audi's 2.0 TFSI four-cylinder 211 horsepower unit with a 54 horsepower, 155 lb-ft of torque electric motor. The hybrid variant has been fitted with an eight-speed automatic gearbox and can go from 0 to 61 in 7.1 seconds. The hybrid model features a battery pack that can deliver an all-electric range of 1.86 miles at the speed of 37 mph. 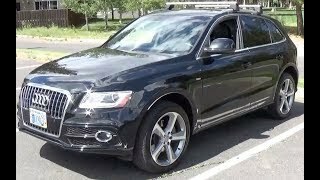 On the exterior the Audi Q5 has received some aesthetic modifications, including new bumpers, a redesigned front grille, a new set of LED headlights as well as a couple of redesigned LED taillights. The interior has been enhanced by a few chrome touches, updated instruments and an improved MMI infotainment system. 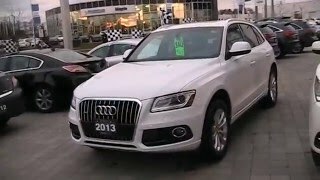 As far as availability goes, the Audi Q5 2013 will show up in showrooms this summer at a starting price of $35,600, when it will be put against its key competitors including the BMW X5, the Volvo XC60, the Mercedes-Benz GLK-Class and the Lexus RX 350.